Hadassah is returning to its founding mandate of community outreach with an initiative that teaches women to better care for themselves and their families. Ethiopian Jewish women in the town of Beit Shemesh teach their Israeli-born neighbors to weave baskets from palm fronds. a Arab women in the nearby village of Abu Ghosh extract permission from their husbands to join a walking group—and they dress up for the occasion, soon discovering that three-inch-high heels are not the best choice of footwear. a North African-born women learn that their traditional 13-egg pie loses little of its flavor and lots of its cholesterol when made from six whole eggs, seven egg whites and whole- wheat flour. What do pies, high heels and palm leaves have in common? Unexpectedly, they are among a range of subjects being addressed in a community outreach program now being conducted by Hadassah’s Patricia and Russell Fleischman Women’s Health Center in Jerusalem. While women’s health activism is widespread in the United States and has a major place in Hadassah’s programs there, it is far less common in Israel—and its promotion here by a medical center is unique. The program now running in Jewish Beit Shemesh and Arab Abu Ghosh is the first of its kind in Israel. Built and run together with local health funds, municipalities, women’s organizations, community bodies, activists, clan leaders and volunteers, it aims to empower women of all ages to take charge of their own physical, mental and social health and to help make beneficial changes in their families and their communities. The town of beit shemesh, 40 minutes west of jerusalem, was chosen as the launch site. A development town built in the 1950’s for immigrants from North Africa, it is now home to newcomers from the Former Soviet Union, English-speaking countries and Ethiopia, as well. Its population of 68,000 is fragmented and lives at a variety of socioeconomic levels. The Hadassah team started by identifying the health needs of the town’s women. They worked with local focus groups (a total of 96 women ages 35 to 70), health services and policymakers and found that workshops explaining the country’s health care system—from patients’ rights to addressing a doctor or nurse without feeling intimidated—would be the most helpful as a start. From there, additional courses could work on other knowledge gaps, such as how to implement and maintain a healthy lifestyle. Sixty women answered the advertisements and began the 60-hour training course. Built by Braverman, Bar-El and the program’s academic adviser through its first six years, Nihaya Daoud, a nurse who last year was awarded a doctorate in public health from Hadassah’s Braun School, the course concentrated on women’s empowerment and creating health-promotion projects. Workshops and programs ranged from meeting with physiotherapists to Sukkot nature excursions, seminars on women’s rights in medical settings to lectures such as “Nutrition for Children in the Modern Era” by Dorit Adler, director of Hadassah’s Department of Nutrition and Diet. The 42 women who completed the program emerged as the leadership nucleus and the key to its success. Together with the Hadassah team, they developed the curriculum, disseminated health-related messages, recruited more local health leaders and reached the women of Beit Shemesh through lectures, workshops and parlor meetings. They also guided the Hadassah team. With the city and its local health funds on board, its women’s council and community center represented on a steering committee with Bar-El in place as project coordinator and the 42 newly minted volunteers, the program was ready to roll in late 2001. Six years on, all this groundwork has proved to be solid, both in Beit Shemesh and Abu Ghosh, where the initiative was introduced three years later. Monthly lectures have covered healthy lifestyles, nutrition, the importance of physical activity (particularly walking), family health, breast health, heart health and bone health. Workshops have focused on ergonomics in the home, menopause, relationships with one’s partner and family, pelvic floor exercises, rights within the health system and improving communication with health care providers. The program now has its own building (a renovated structure owned by Hadassah), a two-mile walking track in Beit Shemesh and its own collection of traditional recipes (among them, the 13-egg pie)—adjusted by Hadassah dieticians Adler and Penina Stein with an eye to health. More Ethiopian women have joined, hooked by the basket weaving. They attend lectures in Amharic about family planning, immunization and the nutritional value of traditional Ethiopian foods (diabetes has become common in the community following the switch to Western foods) as well as how to obtain medical services and what rights they have as patients. Following the Beit Shemesh blueprint, the Hadassah team assembled representatives of local organizations into a steering committee, held focus groups to identify issues and recruited volunteers. At the same time, they learned about Abu Ghosh. The society, they discovered, is divided into five extended families, and volunteers do best working within their own clan. They learned there are wide social barriers to better health in Arab society—among them, excessive eating as a necessary display of thanks to a hostess and a cultural sanction against wasting food. And they learned, too, that men in Abu Ghosh largely control what women do, so gaining their trust was pivotal. Of great help was the enlistment of Abu Ghosh’s respected community center head, a woman born in the village who is also a lawyer and social worker. 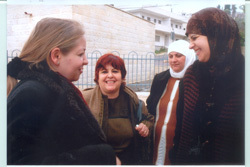 While women in Abu Ghosh and Beit Shemesh were equally eager to learn, the focus groups also revealed wide differences. “Aged 25 to 45, with four to five children each, the Abu Ghosh women are younger than those in the Beit Shemesh program,” says Braverman, “and their interest is in fertility and family planning more than in menopause. And while women in both communities expressed interest in family health, in Beit Shemesh that interest was in relationships between couples, while in Abu Ghosh it was in teen marriage, limit-setting for children and communication within the family. Buoyed by their success, the Hadassah team is planning to bring their initiative to two Jerusalem neighborhoods in the coming months. Both communities are poles apart socially from their forerunners—the Ramat Shlomo suburb in the north of the city is ultra-Orthodox and the Katamon district in the south is low income.